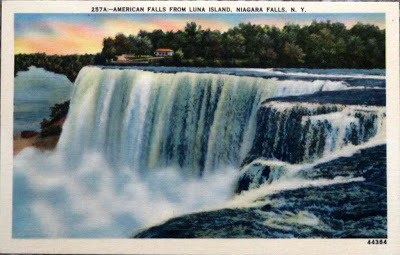 The last postcard in my collection is a symbol of our family vacations at Niagara Falls. 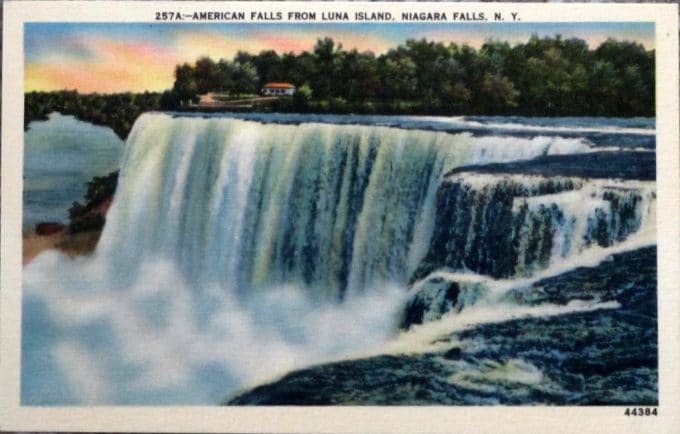 I went there at least once and my parents and other older siblings (pre-Pam era) went a few more times, so Niagara Falls is sort of the family vacation spot. There’s not a whole lot to say about the postcard itself. Yep, it’s showing water falling over this big rock ledge. It is very impressive to see in person though and the falls are very loud when you’re standing there. I can’t imagine why people used to try to go over it in barrels. I know it was probably for the notoriety and all (now days they would just have their own reality program instead), but they really must have been terrified right before the big plunge. And after the big plunge they were either dead or probably regretting the decision. 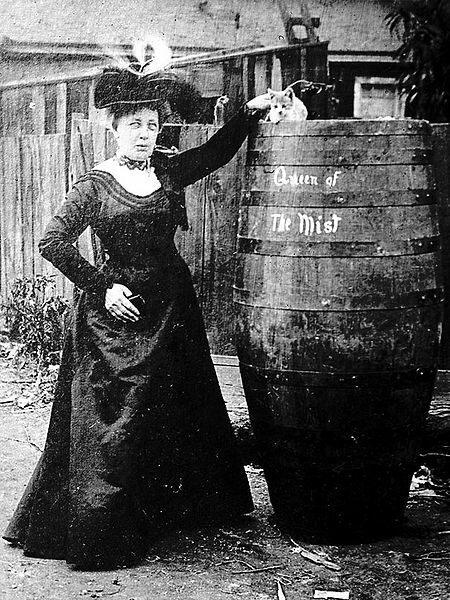 This is a photo of Annie Edison Taylor, the first woman to go over the falls. She successfully completed the stunt in 1901. She was a 46 year old widowed school teacher who had never done anything like this before – talk about a mid-life crisis! I’m thinking of taking the family there on vacation this summer and I’ve just started researching it online. It was there or Washington DC, since DH doesn’t want to drive too far this year. What ever happened to my days of planning relaxing vacations to the Caribbean? 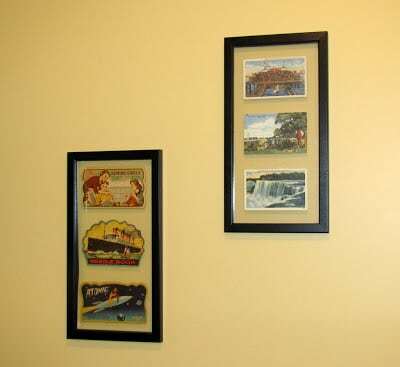 I’ve traded romantic full service hotels with white sand beaches for kid friendly motels near family attractions. Oh well, Pam and Jim from The Office got married there, so maybe it’s coming back into vogue. It’s the new St Thomas for 2010 – right? Here’s where all three postcards normally reside. Right beside my vintage needle book collection which we can discuss in detail next week. Yippee! And I just realized that there is a weird theme in the places that I liked to vacation as a child. Diving horse girls in Atlantic City, circus people in Sarasota and then daredevils at Niagara Falls. Is it the unusual nature of the entertainment acts that I am attracted to? And if so I’m not sure what that says about me. I’m sure I’ll be pondering that thought for the rest of the day. 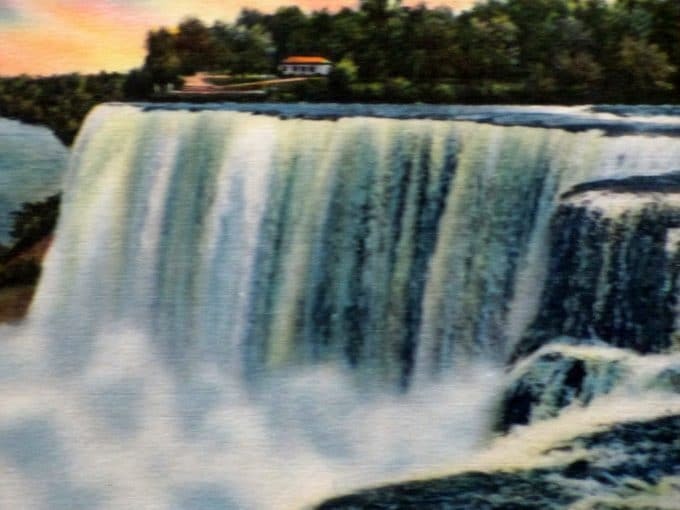 Niagara Fllas is on my list of places to take the kids. It looks like such a pretty and unique place to see. Your not planning an “adventure” of your own, I hope. Have fun planning your trip. It has to be cooler there. I’ve been to Niagra Falls five times over my lifetime (once on our honeymoon) and would definitely go again. Many of the older attractions have lasted and everytime there is a new something to see. But best of all the Falls themselves remain bigger than life. Don’t forget a passport is now required.